Roping Down; fixing thatch in a world without wood. 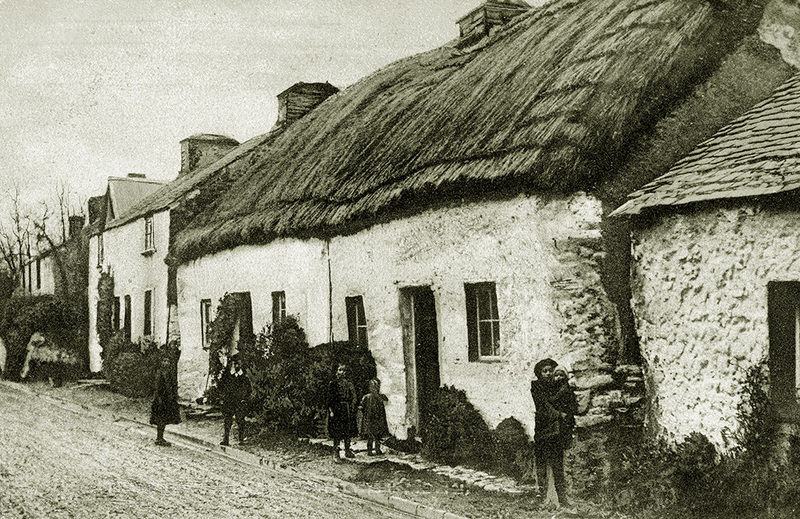 The vast majority of thatching, on multilayered roofs, is held in position by the humble spar. Or if hazel or willow are not to be found; by crook and caber. 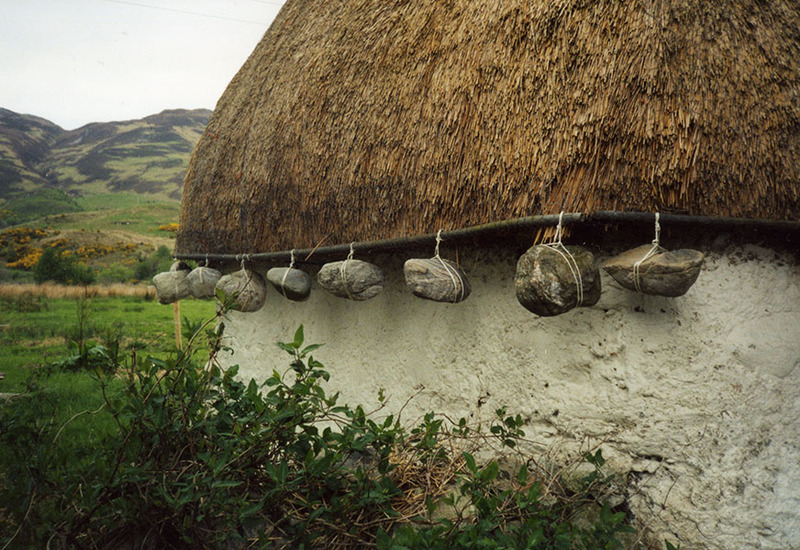 But in some parts of Britain, the raw materials that make these useful items, were once either non-existent or too valuable, to use for thatching. Thus the craft here has evolved, to take account of these conditions; in several ways. 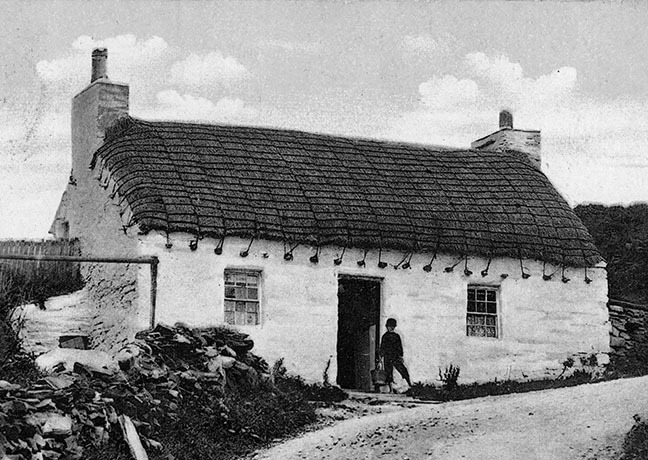 In the north of England and many parts of Scotland, strips of turf were laid across the top of each competed course, of standard thatching. Extending down to where a sway would normally sit. The odd spar was occasionally used, but the weight of turf was sufficient to keep the course in place. A clay mixture or a weak lime mortar was also used in a similar manner. This also had the advantage of holding the succeeding course in place, as it bedded into the mix. A ridge of turf or mortar often finished these roofs. No liggers or spars, being needed to complete either. As will be seen, in the craft’s history; this method is one the earliest recorded, in any detail. Being carefully described, by one Henry Best, in the East Riding of Yorkshire; in 1641. 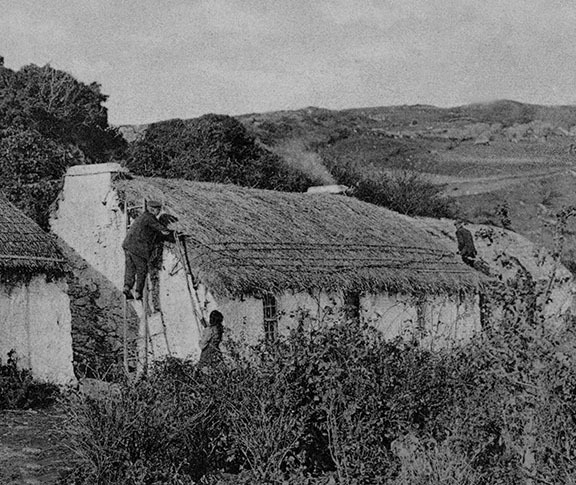 As mentioned in the page on fixing single layer thatch, straw rope was often used to tie on the first coat of thatch, to the roof timbers. But it also had other uses in the craft; on the outside of the roof. Where only a little suitable spar wood was available, straw rope was used as a substitute for wooden liggers. 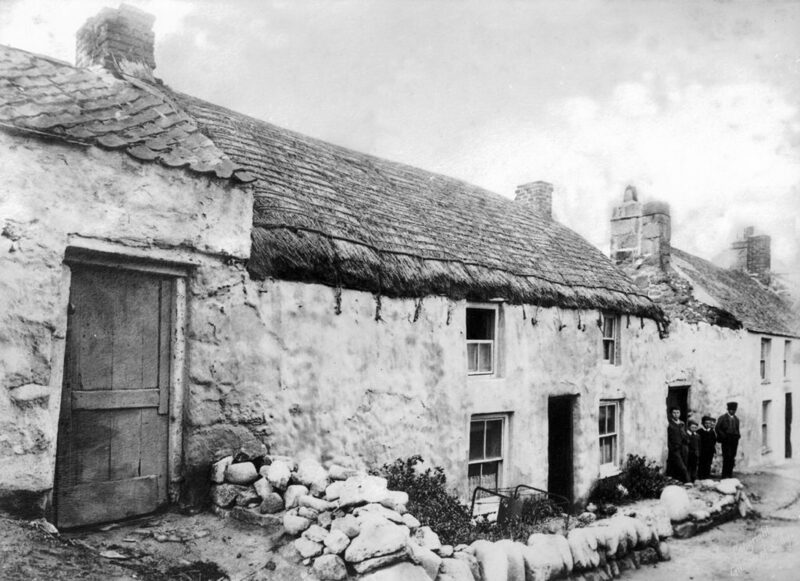 Thatchers in South West Wales, used this technique on many cottages. 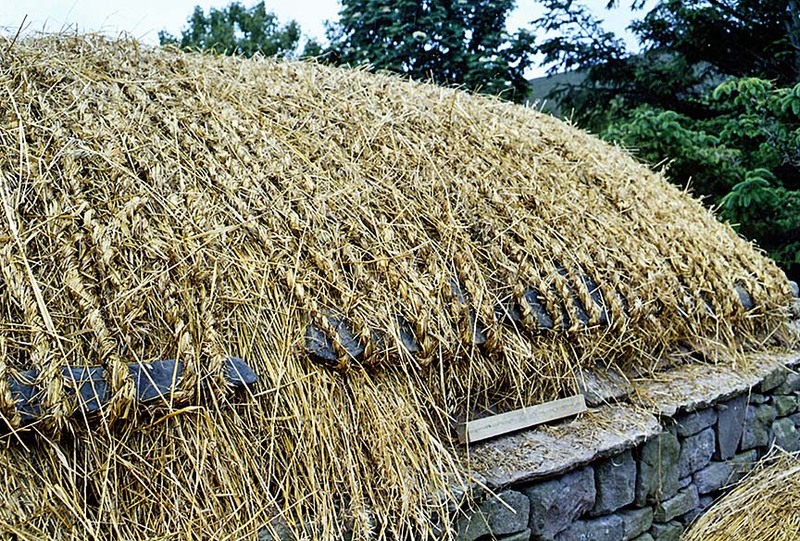 Where wood was really in short supply, straw rope often also substituted for the smaller roof timbers. Where the directional method of thatching is used, the coatwork is fixed entirely from the outside. Traditionally, if suitable wood was unavailable, the roof was roped down, with ropes made of straw or heather and later, hemp. These held thatched roofs firmly in place; all along the northern and western fringes of Britain, from Shetland to the Isles of Scilly. 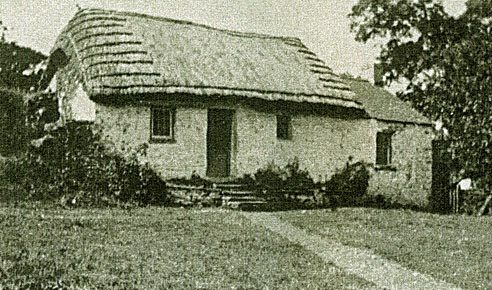 Each area had its thatch roped, in a local, traditional design. Those roofs that remain are now mostly held firm by weighted wire netting. Untold numbers of ricks and stacks, throughout Britain; also had their thatch roped into position. 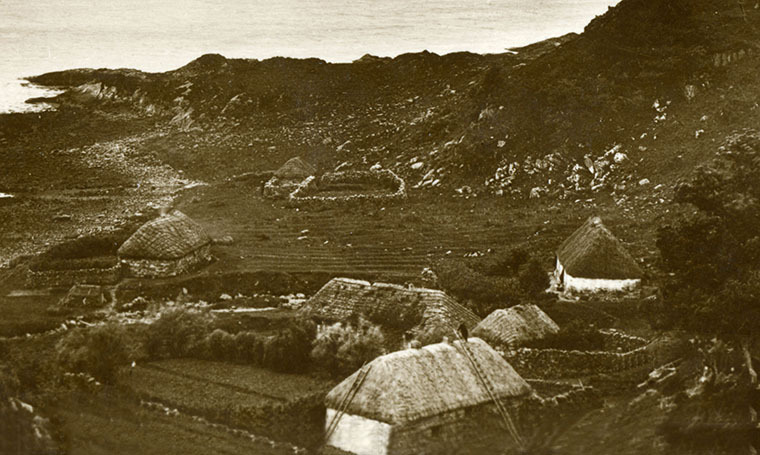 Isles of Scilly… Roped thatch at Silver Street, on St Mary’s, in late Victorian times. This method of fixing hereabouts, was noted as early as 1669. Photo; copyright Gibsons of Scilly. Straw rope was always twisted; several devices being used to help with this process. The Whimble or Thraw Crook, being the most common… Twisting was usually carried out by two people. With one turning the handle of the whimble and twisting the straw; the other person fed the material into the ever lengthening rope. Ropes of heather were plaited, making a rope that lasted much longer, than the couple of years provided by a rope of straw. Both these types of rope were eventually superseded, by more banal materials. Twine for ricks; and from the 1930’s, by wire netting, on cottage thatch. 1930, changes… This long distance view of Loch Aitort ,in Inverness-shire; shows a thatcher, finishing off a directional thatch. A careful look sees our man fixing wire netting… The zig zag wire ties, joining each strip can just be seen, to his left. One other cottage has already been covered thus. The other neighbouring thatches, still have their attractive roping. Not a rope in sight… Some very neat, weighted wire netting. At Ardelve, just across the water from the Isle of Skye. Where some modern thatch, is held tight. 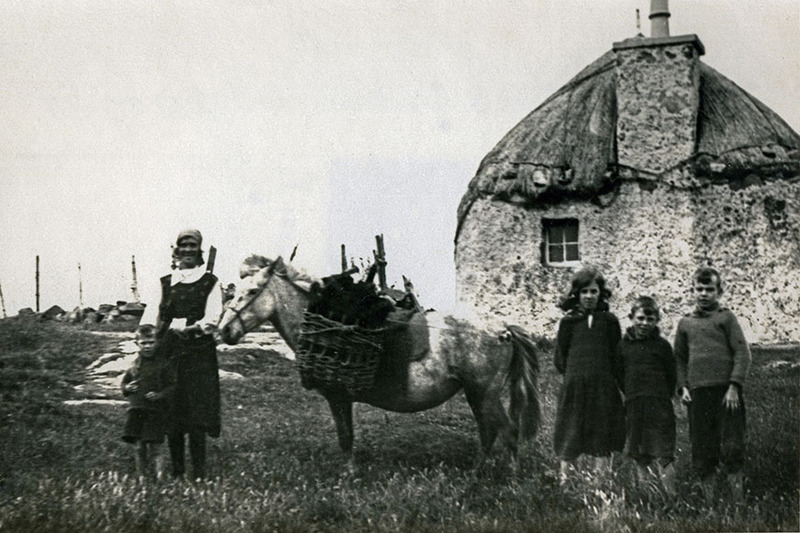 The Hebridean roping traditions, are more closely examined, in the tour around Britain’s thatch. 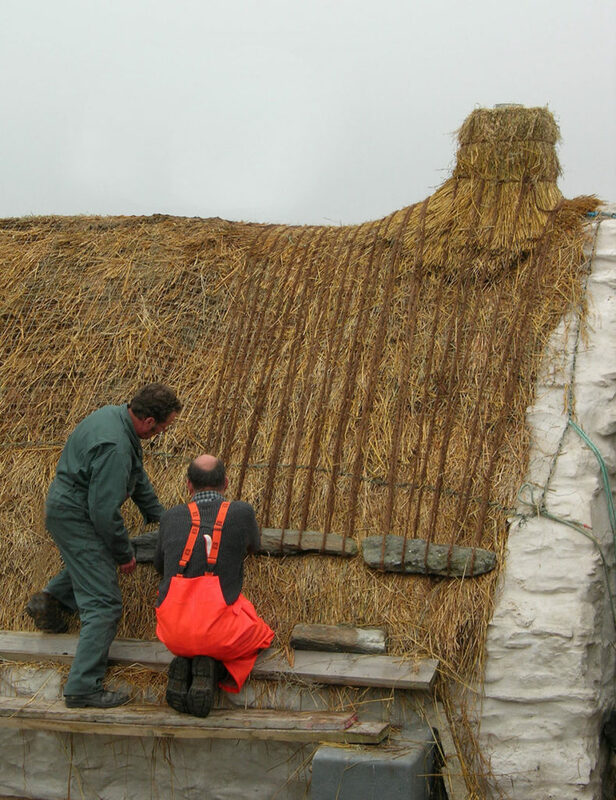 Roping down… A new roof on the croft at Easthouse on Shetland. The local flagstone, making ideal weights, or ‘Linksten‘. Holding the ‘Links’ of rope firmly down. Note the roped chimney or ‘Lum’. These features are examined, along with the more common masonry types in the Technical pages. Photo; courtesy Burra History Group.